Track and follow earthquakes, paint with light, and get full control over how you capture your photos with today’s collection of apps. Tadaa SLR ($3.99 → Free, 27.4 MB): Take fantastic SLR-quality photos with Tadaa SLR. It’s designed for those who want to put their subject in focus. Tadaa SLR is available for free for a limited time. It has a 4.5-star rating with a total of 89 ratings. DealDash ($1.99 → Free, 52.5 MB): Score great deals on everything from the latest tech products to household goods with DealDash. It provides a fun way to shop thriftily. DealDash isn’t like other auction sites in the sense that the price isn’t set by the seller. Instead, bids cost $0.60 each and can be purchased in packs. Each auction starts at $0 with only 10 seconds on the clock. Each bid raises the price by $0.01 and resets the timer. When the timer hits zero, the last bidder is the winner and they get to purchase the item for the final price. Every single purchase includes free shipping. DealDash is available for free today only (09/03). It has a 4-star rating with a total of 496 ratings. Quake Spotter – Map, List, Widget and Alerts ($0.99 → Free, 39.1 MB): Track and follow earthquakes from all around the globe with Quake Spotter. It’ll help you stay informed. Quake Spotter includes data from 13 agencies, allowing you to receive live reports from USGS to GeoScience Australia. The app is able to display details like the magnitude of the quake, its exact location and distance from your position, and the source. If you choose to, you can also receive push notifications for any quake over 4.0 magnitude. All of the information can be filtered and shared as well. Quake Spotter – Map, List, Widget and Alerts is available for free for a limited time. It has a 4.5-star rating with a total of 136 ratings. ReliCam ($1.99 → Free, 2.1 MB): Get full control over how you capture your photos and videos with ReliCam. 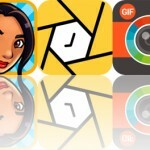 It’s perfect for iPhoneographers who want to personalize their photos. ReliCam is available for free for a limited time. It has a 4.5-star rating with a total of 19 ratings. Lume by Lichtfaktor ($0.99 → Free, 50.4 MB): Paint with light with Lume. It’s a great way to get creative on social media. 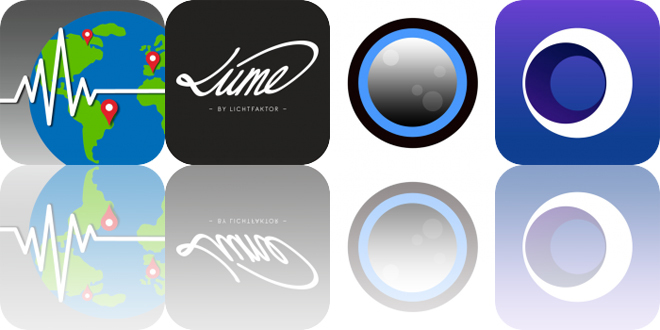 Lume utilizes a powerful 3-D brush rendering engine that provides natural looking results. The app includes 11 brush styles to choose from. You’re able to adjust the width of a brush via a slider, or you can paint with two fingers and change the width on the fly. Photos from your library can be imported and used as a backdrop. 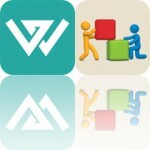 The app also includes undo and redo. Lume by Lichtfaktor is available for free for a limited time. It has a 4.5-star rating with a total of 710 ratings.